The Japan Racing Association will present its 2015 Horse of the Year title to Maurice, who drew 215 out of 291 votes for the outstanding accomplishment of dominating three prestigious G1 mile events in Japan and Hong Kong‐the Yasuda Kinen, the Mile Championship and the Hong Kong Mile‐and winning all six of his starts in 2015. The annual JRA Awards, which will be handed out in a ceremony at Tokyo on Monday, January 25, recognize horses, trainers, jockeys, other individuals and organizations for accomplished performances or achievements in the thoroughbred racing season. Maurice also was selected the Best Sprinter or Miler with 245 votes, becoming the third horse to claim both titles after Taiki Shuttle in 1998 and Lord Kanaloa in 2013. Major Emblem and Mikki Queen were unanimous picks or Best Two-Year-Old Filly and Best Three-Year-Old Filly, respectively, while Best Two-Year-Old Colt Leontes and Best Steeplechase Horse Up to Date both amassed 289 votes. Duramente was the clear winner for Best Three-Year-Old Colt with 285 votes. JRA Best Trainer Awards are presented for Wins, Money Earned and Winning Average based on JRA races and designated NAR and overseas races. Noriyuki Hori won his first title for Races Won and claimed his second title for Winning Average. Yasutoshi Ikee won his third title for Money Earned, following award-winning campaigns in 2011 and 2012. The Award for Training Technique went to Mikio Matsunaga, who became a JRA Award winner for the first time in his ninth season as a trainer. Best Jockey Awards are presented for Races Won, Winning Average, Money Earned, Steeplechase and Newcomer based on accomplishments in JRA races alone. Keita Tosaki won his second consecutive title for Races Won. Foreign jockeys Christophe Lemaire and Mirco Demuro,who both debuted as full-time JRA jockeys in the spring, won the JRA Awards for Winning Average and Money Earned, respectively. Yusuke Igarashi won his first title in five years and third overall for Best Steeplechase Jockey and Katsuma Sameshima was named Best Newcomer. In addition to Best Jockey for Races Won, Keita Tosaki was presented with the Most Valuable Jockey award for the second straight year. The award, established in 2013, recognizes the jockey with the most outstanding accomplishments overall in JRA races and designated races held by NAR or overseas. 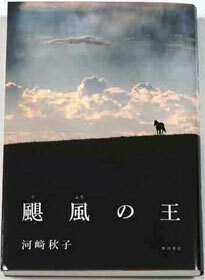 The Equine Culture Award was presented to novelist Akiko Kawasaki for her novel “Gufu no O” (“Lord of the Tempest”). *All information, including ages and race performances, are as of December 31, 2015, unless otherwise indicated. Excluding jockeys, wins and earnings include JRA-designated local public races under the National Association of Racing (NAR) and overseas starts. The “Season Performances” chart shows the horse’s positions in the 1st, 2nd, 3rd and final corners, from left to right. “L3F” and “[Horse]” indicate time over the last 3 furlongs (600m) and the horse’s weight, respectively. Maurice concluded an incredible season with a perfect score of six wins out of as many starts after JRA Award-winning Nobuyuki Hori took over his training. The Screen Hero entire not only became the sixth horse to claim the Yasuda-Mile Championship double in the same year-last accomplished by Daiwa Major in 2007-but also won the Hong Kong Mile in December, validating his talent against an international field of high-class milers. Maurice showed potential in his two-year-old debut with a dominating three-length margin and in record time for a two-year-old at Kyoto for former trainer Naohiro Yoshida. But after scoring another victory that season, he did not progress as expected in the spring of his three-year-old campaign and was unable to make the three-year-old Classics. He was moved to his present stable and, following a transforming six-month break, came back in January of this year at Nakayama for his third career win, an overwhelming victory reminiscent of his debut. He demonstrated a terrific turn of speed after missing his break and racing from behind in his next two starts-the latter being his first grade-race victory in the Lord Derby Challenge Trophy, where he broke the race record set by Daiwa Major in 2005 by 0.1 second. Breaking smoothly in his first G1 challenge in the Yasuda Kinen, he secured a good position around fifth and prevailed by a neck after assuming command at the stretch to become the first horse sired by Screen Hero to claim a G1 victory. Sent to post fourth choice after coming off a five-month break and passing up a prep race prior to the Mile Championship, he proved any doubters wrong and exceled again under Ryan Moore, who gave him a clear run home to allow the four-year-old to cruise to a 1-1/4-length victory. In his first overseas challenge in the Hong Kong Mile, the exceptional miler overcame the disadvantages of long travel and new surroundings to show great determination in regaining the lead from local hero Able Friend, who overtook the bay colt with less than 100 meters to go, to score a 3/4-length victory. Leontes won the biggest title for two-year-olds in only his second career start, becoming the first colt in JRA history to accomplish the feat since the grade system was implemented in 1984. Sired by 2004 Tokyo Yushun victor King Kamehameha, who won seven out of eight career starts between 2003 and 2004, and out of Cesario, a G1 Oaks winner in Japan and the U.S., the champion two-year-old is also half-brother to 2014 Japan Cup winner Epiphaneia. He garnered high expectations in his late two-year-old debut over 2,000 meters at Kyoto in November, living up to his pedigree by easily staying close to the leader despite breaking from stall 15. After keenly holding in the early stages, he still had plenty left in the closing stages and sped to a 1-1/2 length victory, covering the last three furlongs in 33.4 seconds. His outstanding performance and superb pedigree were convincing enough to place him second favorite when he jumped up in class, only four weeks after his sensational debut, to challenge proven two-year-olds in the Asahi Hai Futurity Stakes. 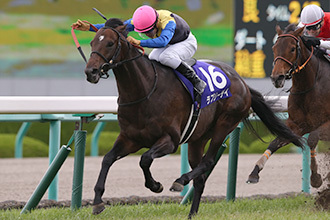 Leontes was positioned at the rear of the 16-horse field under Mirco Demuro, but he gradually made headway with 800 meters to go. Approaching the last corner, the dark bay colt circled wide into the homestretch and unleashed a tremendous turn of speed that enabled him to race past the entire field and pin down race favorite Air Spinel soon after the 100-meter marker, then pull away to a 3/4-length victory. Major Emblem lived up to expectations by winning the Hanshin Juvenile Fillies as race favorite and concluding her outstanding two-year-old debut season with three wins and a second out of four starts. Sired by two-time JRA Award winner (Best Sprinter or Miler, 2006 and 2007) Daiwa Major, Major Emblem won her debut at Tokyo Racecourse in June with a fast finish after racing close up for a comfortable 1-/1/2-length victory. She was even more impressive in her following race, demonstrating a terrific turn of speed after taking a wide trip behind a slow pace in mid-division and powering past the leader for a 2-1/2-length win. The chestnut filly appeared to have her third consecutive victory in hand in her first grade-race start, the Artemis Stakes, in which she was on the bit along the outside from stall 15 and sustaining the lead in the straight after taking command at the third corner. But unaware that the eventual winner was creeping up further out, she was pinned at the last minute to miss by a neck. Partnered with Christophe Lemaire, who is full of praise and confidence in the filly ever since her debut, Major Emblem did not disappoint in her G1 challenge, breaking sharply and racing close to the leaders in third, then taking control entering the stretch to sprint clear of the field for an unchallenged two-length victory. 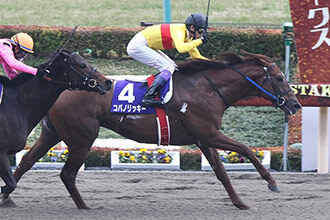 Her three-year-old season will commence with the Queen Cup (G3, 1,600m) on February 13. Duramente was voted the season’s Best Three-Year-Old Colt by an overwhelming margin for a remarkable 2015 campaign that was cut short prior to a possible Triple Crown title or an overseas challenge. The King Kamehameha colt performed beyond expectations when sent to post third favorite in the Satsuki Sho (Japanese 2000 Guineas). In the Tokyo Yushun (Japanese Derby) he performed as advertised, storming home in record time for the second jewel in the Triple Crown. Out of G1 winner Admire Groove, whose dam Air Groove was the 1997 Horse of the Year, the King Kamehameha colt attracted high hopes from the beginning of his career as a potential classic winner. Although beaten by 3/4 length in his two-year-old October debut, in his following start he proved to be of a different class when he broke his maiden by a dominating six-length margin. He kicked off his three-year-old season with another five-length victory. In the Kyodo News Service Hai, he took hold early but didn’t have enough left after taking the front at the stretch and was outrun by the winner, finishing in second by a 1/2-length. He bounced back in his following start, the Satsuki Sho, where he was unhurried near the rails about three horses from the rear. He gradually made headway, then lost a fair amount of ground as he leapt to the outside rounding the last corner, but an explosive turn of foot quickly drew him level with the leaders with a less than 100 meters to go, and then suddenly he drew away for a 1-1/2-length victory. Following his Tokyo Yushun victory, attention focused on whether Duramente would go for the Triple Crown in the Kikuka Sho (Japanese St. Leger) in October, or challenge the world’s best in the Arc, which is thought to be his best distance at over 2,400 meters. But then fractures in both forelimbs prompted surgery to remove bone chips, requiring him to take off the rest of the season for recovery. The talented colt will begin his four-year-old campaign with the Nakayama Kinen (G2, 1,800m) on February 28, prior to an overseas challenge in the Dubai Sheema Classic (G1, 2,410m) on March 26. Winner of two legs of the season’s fillies’ Triple Crown, Mikki Queen concluded her outstanding three-year-old campaign by marking 3-2-0 out of six starts and a close eighth against top-class runners in the Japan Cup. The Deep Impact filly registered a second in her debut as a two-year-old and notched her first win by a promising two-length margin in her next race two weeks later. Her first start of her three-year-old season was her first graded attempt, the G3 Queen Cup, in which she closed well, registering the fastest charge in the field from far behind, but came up a neck short to finish second. Although well rested and ready for a challenge in the Oka Sho (Japanese 1000 Guineas), she unfortunately missed out in the entry draw, but she scored an open-class win on the same race day and at same racecourse as the first leg of the fillies’ classics. Qualifying for the second leg, the Yushun Himba (Japanese Oaks), Mikki Queen was sent off third favorite and raced wide in mid-pack before pinning front-runner Rouge Buck in the last half-furlong for a 3/4-length win. The filly gave trainer Yasutoshi Ikee his first G1 title for fillies/mares. The three-year-old was off slow in the Rose Stakes, her fall debut, but from the far rear she produced the fastest charge over the last three furlongs to catch all but the winner for a 1-1/2-length second. In the last leg of the fillies’ Triple Crown, the Shuka Sho, a start from the widest stall did not hinder her performance whatsoever. She demonstrated an amazing stretch run after powering through horses at the top of the straight to take command in the last 100 meters and prevail in record-breaking time, holding off a late charge by Queens Ring for a neck victory. 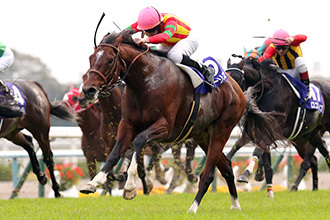 She is headed towards the Victoria Mile (G1, 1,600m) on May 15 for her 2016 spring campaign beginning with the Hanshin Himba Stakes (G2, 1,600m) on April 9. Kaneko Makoto Holdings Co., Ltd.
Lovely Day enjoyed his best season yet in 2015 as the late-developer claimed six grade-race titles, including two G1 victories. 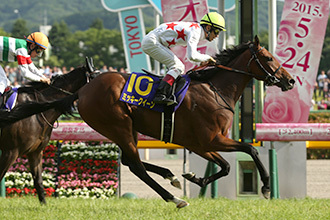 In the Takarazuka Kinen in June, he took the lead after pressing the pace in second and accelerated strongly in the last 200 meters for his first G1 title. In the Tenno Sho (Autumn) in November, the son of King Kamehameha was rated toward the front and easily stole the lead before the furlong pole to pull away, repelling a strong challenge from the runner-up for a half-length victory. After winning his first two starts as a two-year-old, the dark bay made a runner-up effort in his first graded attempt in the Keio Hai Nisai Stakes. In his three and four-year-old campaigns, however, he was unable to score a grade-race victory despite turning in a number of runner-up efforts in G3 and G2 events. Lovely Day’s big break came in the beginning of his five-year-old season, when he won his first two starts of 2015, the Nakayama Kimpai and the Kyoto Kinen, the former being his first grade-race victory. 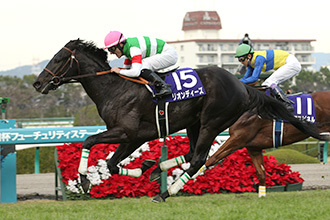 While unable to exert his ability in longer distances over 3,000m in his following two starts, he was back on the winner’s podium with four consecutive victories-all graded races-prior to a neck-and-neck third in the Japan Cup and a credible fifth in his tenth start of the season, the Arima Kinen. After a long and fruitful season, the son of King Kamehameha will focus on his best distance at around 2,000 meters. He is due to return for his six-year-old campaign in the Sankei Osaka Hai (G2, 2,000m) on April 3 and then the Hong Kong’s Queen Elizabeth II Cup (G1, 2,000m) on April 24. Shonan Pandora became the eighth female runner to claim the Japan Cup title, securing her hold on the season’s JRA Award for Best Older Filly or Mare. Following a runner-up finish in her only start as a two-year-old, Shonan Pandora broke her maiden in her kick-off start the next season, but was short of qualifying for the three-year-old fillies’ spring classics. However, after powering up during the summer, the Deep Impact filly demonstrated a convincing drive in record time down the Kyoto stretch to capture the final leg of the Triple Crown for fillies, scoring her first grade-race victory with a G1 win and giving trainer Tomokazu Takano his first G1 victory in his fourth year. She was sixth against more experienced rivals in the Queen Elizabeth II Cup. In her first two starts of 2015, the Sankei Osaka Hai and the Victoria Mile, she was well beaten to ninth and eighth, respectively. Following a third-place finish in the Takarazuka Kinen, she took a three-month break and then improved significantly to become the first female in 18 years to land the G2 All Comers. Earning a place in the Tenno Sho (Autumn) lineup, she was sent to post fifth favorite but was forced to race wide and behind from an outside stall. Unable to reach the leader, she finished fourth despite recording the fastest finish over the last three furlongs. Starting from stall 15 in the Japan Cup, jockey Ikezoe kept the filly more to the inside in mid-field and the bay filly found herself in tight quarters at the top of the straight, and then again 150 meters out. But she gained powerfully on Lovely Day to out-duel the favorite, then pinned Last Impact, who had held a brief lead along the rails, for a neck win. 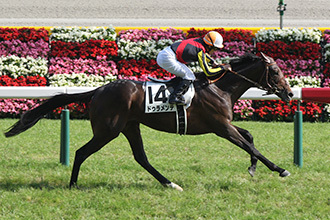 Trainer Takano, who is careful to take each race one at a time, has the Takarazuka Kinen on June 26 in mind as her spring target, but may also start her in the Victoria Mile depending on her condition. Copano Rickey, who demonstrated a sensational breakthrough in 2014, accomplished another outstanding feat to claim the JRA Award for Best Dirt Horse. After securing the Tokai Stakes easily by four lengths, the five-year-old was sent to Tokyo aiming to become the first to defend a February Stakes title as the heavy favorite. Indeed, he did it with style by pressing the pace and quickly inheriting the lead two furlongs out for a half-length win. But during the race he sustained a minor fracture in his left foreleg, forcing him to the sidelines for over seven months. After marking a third in his comeback start in the Nippon TV Hai, he defended his JBC Classic title with an impeccable wire-to-wire win 2-1/2 lengths ahead of the closest pursuer. Sired by 2002 Best Dirt Horse Gold Allure, Copano Rickey has raced exclusively on dirt since his two-year-old debut. He registered his first win in his three-year-old debut and scored his inaugural graded-stakes victory in the Hyogo Championship-a wire-to-wire win six lengths in front of the runner-up. But then he was diagnosed with a radial fracture in his right foreleg, and following a six-month recovery, his two starts at the end of the season were not as encouraging as hoped. He kicked off the 2014 season with a stunning triumph to claim the February Stakes with a half-length win, upsetting a field of top dirt runners and holding off a persistent challenge from subsequent JRA Award-winner Hokko Tarumae. He followed up with two more G1 wins in the Kashiwa Kinen and the JBC Classic, where he set a new record on a track rated muddy, but was well beaten in the Champions Cup and was also beaten by Hokko Tarumae in votes for the season’s JRA Award. In a vote that was divided among a number of horses, Copano Rickey,although beaten again in the Champions Cup, won the Best Dirt Horse award by a comfortable margin thanks to convincing results throughout the season. Up to Date claimed this year’s Nakayama Daishogai in a three grade-race winning streak starting with the Nakayama Grand Jump in April, thereby ensuring his JRA Award for Best Steeplechase Horse in 2015. He is the first horse to win both J-G1 races in the same year since the grading system was introduced to steeplechase racing in 1999. His victory in the Nakayama Grand Jump also renewed the race record previously set in 2004 by 0.4 second. 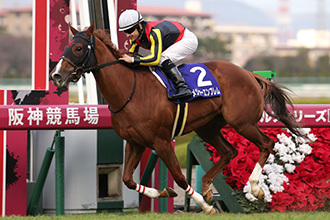 The son of 2001 Best Dirt Horse Kurofune broke his maiden in his two-year-old debut and concluded the season by registering 2-1-1 out of five starts. In his 2014 season, however, winless with just one fifth place in 10 starts, he was switched to obstacle racing in September. He won his first steeplechase start in his second career start, finished fourth in his first grade-race challenge in the 2015 Hanshin Spring Jump, and then scored a dominating victory in the Nakayama Grand Jump in which he was five to six lengths ahead at the last obstacle before drawing further away. His second grade-race victory came in the Kokura Summer Jump, but an injury in the effort caused a minor change in his racing schedule and he was forced to miss his intended prep start prior to the Nakayama Daishogai in December, which turned out to be his first race in five months. Starting from an outside stall, which could not have helped, Up to Date moved smartly to secure a good position and made use of his stamina to outduel the up-and-coming race favorite, Sanacion, who had been undefeated in five starts since switching to steeplechase racing in April. The gray horse then held off a late charge by Acorn Path for a 1/2-length victory. Up to Date is due to begin his 2016 season with the Hanshin Spring Jump in preparation for his bid to defend his title in the Nakayama Grand Jump on April 16. Noriyuki Hori won his first JRA Award for Races Won with 56 victories and his second title for Winning Average with a strike rate exceeding 23% during 2015. Among his major wins were six G1 titles, including with Maurice in the Yasuda Kinen, the Mile Championship and the Hong Kong Mile; with Duramente in the Satsuki Sho (Japanese 2000 Guineas) and the Tokyo Yushun (Japanese Derby)-the first two legs of the three-year-old classics-and with Real Impact in Australia’s George Ryder Stakes. He also won four other grade-race titles. Hori began working as a groom at Tomizo Suwa’s stable, then became an assistant trainer under Yoshitaka Ninomiya, who is best known for saddling multiple G1 winners El Condor Pasa and Nakayama Festa in the Prix de l’Arc de Triomphe in 1999 and 2010, respectively. 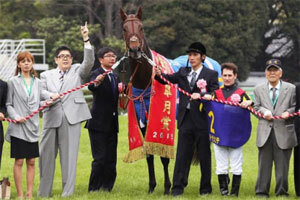 Hori opened his own yard in 2003 and notched his first win in his 23rd start. 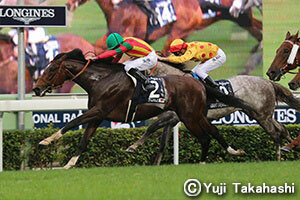 He captured his first grade-race title in his fourth season when Venus Line won the 2006 Hakodate Sprint Stakes (G3). His win total began to climb in 2009 when he posted 31 victories, ranking eighth in eastern Japan (Miho Training Center) and 22nd in the JRA national rankings. He was 12th nationally with 36 wins in 2010, the year he won his first G1 title with Kinshasa no Kiseki in the Takamatsunomiya Kinen (Kinshasa no Kiseki defended the title the following year and won seven graded stakes between 2008 and 2011). 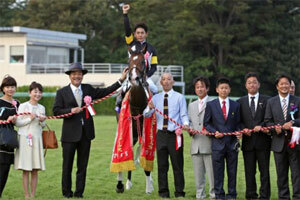 Hori also saddled Jaguar Mail to victory in the 2010 Tenno Sho (Spring) (G1). He was the Kanto area’s leader in Training Technique every year between 2010 and 2013 and then placed second in 2014 and 2015. He notched 43 wins out of 214 starts to claim his first JRA Award for Best Trainer (Winning Average) in 2011. Yasutoshi Ikee enjoyed another successful season to earn Best Trainer (Money Earned) for a third time, following his record-breaking 2011 campaign with Triple Crown-winner Orfevre and then again in 2012. His 49 wins included 10 grade-stake titles with four runners, most notably Lovely Day in the Nakayama Kimpai (G3), the Kyoto Kinen (G2), the Naruo Kinen (G3), the Takarazuka Kinen (G1), the Kyoto Daishoten (G2) and the Tenno Sho (Autumn) (G1), and Mikki Queen in the Yushun Himba (Japanese Oaks, G1) and the Shuka Sho (G1). While based at the highly competitive Ritto Training Center in the Kansai area, Ikee quickly established himself as a prominent contender after acquiring his trainer’s license in 2003. Already a JRA Award recipient for Winning Average in 2006, he led the nation with 51 wins in 2008 to claim both the JRA Award for Races Won at 39-the youngest in JRA history-and Training Technique. He landed his second title for Winning Average in 2010 and then enjoyed his best season yet in 2011 with 11 grade-race wins and a record-breaking annual earnings of 2,433,946,500 yen. Orfevre, winner of the season’s Triple Crown as well as the Arima Kinen in December, contributed to four of Ikee’s five G1 titles-the other coming with Tosen Jordan in the Tenno Sho (Autumn). Ikee tied Ichizo Iwamoto’s 2000 record for most G1 wins in a season. The son of former trainer Yasuo Ikee, Yasutoshi began as a groom and then an assistant trainer for Kuniichi Asami’s yard. He worked at his father’s stable before studying the art of training in England and the U.S. under top trainers Sir Michael Stoute and Neil Drysdale, respectively. After opening his own yard in 2004, he continued to support his father when Deep Impact traveled to France for the Arc and he took his own Picaresque Coat along to run in the Prix Daniel Wildenstein (G2), finishing second. In 2006, he saddled his own grade-one winner and the year’s eventual JRA Best Two-Year-Old Colt, Dream Journey, whose sire Stay Gold was a favorite of Ikee during his assistant trainer days. Orfevre, undoubtedly his best horse yet, is a full brother of Dream Journey. Mikio Matsunaga won the Best Trainer for Training Technique, which is given to the trainer with the most high-quality runners per yard based on wins, purses and number of starts. The jockey-turned-trainer, who earned his first JRA Award of his career in either capacity, saddled 44 winners (including jump races and designated NAR races) in 2015. As a jockey, Matsunaga registered 1,400 wins, including 54 grade-race titles, six at the JRA’s G1 level, between 1986 and 2006. He began riding for Shoji Yamamoto at Ritto Training Center and notched 40 wins in his debut season. While overshadowed by Yutaka Take, who debuted a year later and swept up the majority of jockey titles for some time, Matsunaga turned in consistent results in the highly competitive Kansai district, including a personal-best 101 wins in 1997. All but one of his six G1 victories were in races limited to mares or fillies, the exception being 2005 Tenno Sho (Autumn), which of course has no such limitation, yet he won aboard Heavenly Romance-also a mare. Matsunaga acquired his trainer’s license and hung up his riding boots in 2006 to take over Yamamoto’s yard upon his master’s retirement. He saddled his first winner in March 2007 in his 12th start. His first grade-race victory came in the summer of 2009 with Dance a Joy in the Kokura Kinen. Red Desire gave him his first G1 title in the Shuka Sho a few months later. Matsunaga also showed his skills in training jumpers, claiming the 2014 Nakayama Daishogai with Red Kingdom. Keita Tosaki won his second consecutive titles for both Races Won and Most Valuable Jockey with 130 wins during 2015. The former top NAR jockey was also runner-up to Mirco Demuro in purses, having won eight grade-race titles, including G1 victories with Straight Girl in the Sprinters Stakes and the Victoria Mile, as well as five graded NAR stakes. The talented rider also went to Hong Kong to experience the first overseas challenge in his third season as a JRA jockey, perhaps paving the way for further success in 2016. Tosaki’s career began in 1998 at Ohi Racecourse as a stable jockey for trainer Kazutaka Katori. He rode his first winner in April that year, reached his 100th win in 2002 and landed his first major title in the Twinkle Lady Sho with Koei Sophia in 2005. He nearly doubled his wins from 74 in 2005 to 123 the following year, then rose to third on NAR’s national jockey rankings with 212 in 2007, the year when he also scored his first JRA win at Hanshin Racecourse. This began a remarkable string of successes as the four-time national leader in 2008, 2009, 2011 and 2012. Given opportunities on JRA mounts, Tosaki scored his first JRA grade-race win in 2010 in the Musashino Stakes (G3) with Glorious Noah. He followed this with his first JRA-G1 victory in the 2011 Yasuda Kinen with Real Impact. Transferred to JRA racing in 2013, Tosaki was quick to place himself among the top five jockeys on the national rankings with 113 wins in 2013, including a G1 title with Red Reveur in the Hanshin Juvenile Fillies. These, plus four other grade-race victories, earned him recognition as a reliable jockey and rides in almost every G1 event. His success continued in 2014, when he led the national standings with 10 more wins than the runner-up in only his second season. That same year, he hit the 100th mark in annual wins and reached his milestone 300th career win, both in September, but he missed his first classic title in the Oka Sho (Japanese 1000 Guineas) by a neck to Harp Star aboard Red Reveur, Tosaki’s capped his outstanding 2014 season with a victory in the year-end Arima Kinen aboard Gentildonna. Christophe Lemaire debuted as a JRA regular jockey in 2015 after passing the exam together with Mirco Demuro. Kicking off his career in April, he still managed to notch 112 wins to stand fourth on the leaderboard and register the highest winning percentage to receive the award for Best Jockey (Winning Average). His achievements included a G1 victory in the Hanshin Juvenile Fillies with Major Emblem and eight other grade-race wins, as well as an NAR-G1 win in the Japan Dirt Derby with Nonkono Yume. Born in Chantilly as the son of Patrice Lemaire, a leading jump jockey in the 80s, Christophe Lemaire was riding horses before he was walking. His career began as an amateur rider in 1996 at the age of 16. Accumulating valuable experience while exercising horses for well-established trainers such as Andre Fabre and Jean-Paul Gallorini, he started riding professionally after acquiring his license in 1999. He scored his first G1 title in France in the 2003 Prix Jean Prat. He was soon among the top jockeys at home and became a prominent international rider with G1 titles in France, England, the UAE, Australia, Hong Kong and the United States. Christophe Lemaire had been racing in Japan every year since 2002 under short-term licenses. His major JRA titles began with a G1 victory in the 2005 Arima Kinen with Heart’s Cry, followed by the 2008 Queen Elizabeth II Commemorative Cup with Little Amapola, the 2008 Japan Cup Dirt with Kane Hekili, the 2009 Japan Cup with two-time JRA Horse of the Year Vodka and his second Japan Cup Dirt in 2013 with Belshazzar. With his first full season kicking off in January, he is expected to score even more successes and achieve new personal milestones in 2016 and beyond. Mirco Demuro quickly rose to prominence in his debut season as one of Japan’s first two foreign jockeys to acquire official JRA jockey licenses in March. Having claimed two of the three-year-old classics during the spring and two more G1 titles among 11 grade-race victories, he amassed a total of 2,803,146,000 yen to win the season’s JRA Award for Best Jockey (Money Earned). Landing the Hankyu Hai (G3) within his first week on the job, he then captured the first two legs of the Triple Crown Classics with Duramente. Counting past wins during a number of short-term riding stints over a span of 15 years, he became the first foreign jockey to reach 400 JRA wins on July 25. Debuting in Italy in 1994 at age 15, Demuro became a champion apprentice with 79 wins in the following year. He was the leading jockey in Italy for four consecutive years between 1997 and 2000, including as Italy’s first teenage champion. His first group-race victory came in 1998 in the Premio Primi Passi (G3, Solitary Dancer) and his first G1 title was the Gran Premio del Jockey Club (Sumati) in 1999. From early in his career, Demuro sought success at the international level and rode in numerous countries. He started riding in Japan under a short-term license in 1999 and found his riding skills were well appreciated. Given opportunities on talented mounts, he landed 31 grade-race titles, including 10 G1 victories, between 2001 and 2014. He captured his first two classic titles with Neo Universe in 2003 in the Satsuki Sho and the Tokyo Yushun, and rode the lightly regarded Screen Hero to victory in the 2008 Japan Cup. 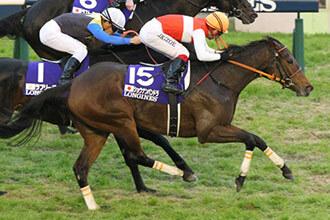 Demuro also gave Japanese racing a historic first success in the Dubai World Cup with Victoire Pisa in 2011. With the sport of horse racing in his homeland facing a crisis in recent years, Demuro continued to ride in not only Japan, but also Europe, the UAE and Hong Kong. When the opportunity for foreign jockeys to ride regularly in Japan came his way, he failed in his first written test in 2013 but then succeeded in his second try in 2014, together with French jockey Christophe Lemaire. The two jockeys passed their second oral tests in Japanese and were granted licenses to start riding year-round beginning in March 2015. Yusuke Igarashi claimed his third title for Best Steeplechase Jockey after becoming the youngest jockey in JRA history to win the title in 2009. He then repeated the feat in 2010. This year, while falling short of his personal best of 14 wins in 2009, he scored 11-9-8 from 90 jump-race starts to barely put him ahead of Jun Takada, the 2014 award winner of this category. Debuting in 2002, Igarashi began his jockey career under trainer Yasuo Sugawara and registered 11 wins out of 189 mounts on the flat, plus one win out of 23 over obstacles. While continuing to ride on the flat, Igarashi began to devote more of his rides over obstacles from 2007, when he captured his first major title with Best Grand Cha in the Tokyo Autumn Jump (J-G3). He more than doubled his win total in 2009 to claim his first JRA honor and then landed three grade-race titles among 13 wins in 2010. He captured his much-awaited first J-G1 title in the 2013 Nakayama Daishogai with Apollo Maverick, after which he validated the win with another J-G1 victory in the 2014 Nakayama Grand Jump. Katsuma Sameshima achieved a personal goal by claiming the JRA Award title for Best Jockey (Newcomer) with 39 wins out of 519 rides in his first season as a JRA jockey. Katsuma watched his father, Katsuya, a 12-time champion jockey who still rides at Saga Racecourse, win the 2001 World Super Jockey Series against top JRA jockeys and international invitees. Katsuma aspired to become a jockey himself and began riding horses from fifth grade while also taking gymnastic lessons to improve his balance and muscle tone. Riding under trainer Hidekazu Asami upon graduating from JRA’s Horse Racing School in February 2015, he scored his first win on March 14 at Chukyo. He was second best among first-season jockeys with 17 wins by August and then ultimately overtook his rivals to win by nine victories for the champion title. He also had the rare opportunity to compete against his father, who was invited as a NAR contender, and his brother Ryota, also a JRA jockey, at Kokura in August. The JRA Equine Culture Award recognizes noteworthy achievements and contributions to Japanese equine culture. Nominations for the 2015 award included horse-related cultural events and publications that were held or published between November 2014 and October 2015. The Equine Culture Award for 2015 was presented to the novel "Gufu no O." The story largely takes place on the island of Hokkaido, a thoroughbred breeding center and an area deeply connected with horses since the 19th century, when horses were an integral part of daily life. The story vividly illustrates how people and horses can join together for survival. “Gufu no O” is the saga of a family rooted in the northern Japan, where people are forced to confront harsh winters and the power of nature. The story, which is divided into three sections covering six generations of the family, begins with Sutezo, a young man who decides to leave his home on Japan’s main island to seek a new life in Hokkaido during the late 19th century. One day, he received a letter from his mother Mine, whom he had left behind, in which he learned the true story of how he came into the world. Mine had suffered the misfortune of a failed elopement that had left her alone and pregnant with Sutezo. Adding to the tragedy, she became lost and had to take refuge in a snow cave together with her much-loved horse. Trying to stay alive, she fed the horse her own hair and ate the horse’s mane, as wild horses do in times of starvation. Finally, left with no other choice, she was forced to eat her beloved horse’s flesh to save her precious unborn child. Sutezo, upon learning that he was beholden to a horse for his life, chose to devote himself to raising these magnificent animals. At first he was successful, but gradually he succumbed to the harsh forces of nature and lost everything but his beloved family. Having learned firsthand about the challenge of confronting things beyond the reach of human power, he gradually related his hard-earned life-lessons to his granddaughter, Kazuko. Time passed, and Kazuko herself became a grandparent and then suffered a cerebral stroke. The story then shifts to her granddaughter, Hikari, who strove determinedly to overcome things beyond her control and somehow communicate with her impaired grandmother. Like her forbearers, Hikari courageously confronted nature and the limits of human ability. Hokkaido native Akiko Kawasaki was born in 1979 and received a degree in economics from Hokkai-Gakuen University. After a year in New Zealand learning about sheep farming, she returned to Bekkai, Hokkaido to help with her family’s dairy farm, and also keep her own small flock of 30 sheep to raise for meat. After taking up creative writing during college, at the age of 30 she finally began writing fiction when not doing chores on the farm. 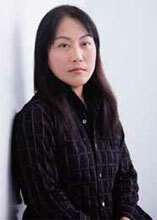 Her previous novel, “Tosu Iji” (“Rituals of the East End”), won the Hokkaido Shimbun Literary Award in 2012. “Gufu no O” received the Miura Ayako Literary Award in 2014.